On 26 October AMOLF and Delft/BN PI Sander Tans and colleagues have published an article in Nature that overturns the decades-old textbook model of action for a protein that is central for many processes in living cells. In their paper, the researchers show that the protein Hsp70 can mechanically stabilize folded proteins using a moveable lid, and thus protect them against stress and damage. This insight into how proteins help each other, offers a new perspective on diverse cellular functions and can ultimately lead to a better understanding of certain types of cancer and Parkinson's disease, in which failing protein systems are central. "Proteins collectively control nearly all processes in living cells. They bind briefly, perhaps catalyze a reaction, and then release again. Most proteins have specific binding sites and specific binding partners, but some have a more universal function", explains Sander Tans, who investigates such chaperone proteins as the head of the Biophysics group at AMOLF. "Compare it with tools: you can use specific tools for certain tasks, but with a universal tool you can tackle several tasks. A chaperone protein is like a universal tool that can bind to any other protein and help or hinder its function." Tans and his colleagues used an optical tweezers setup to investigate the function of HsP70. "With this technique we can pick up a single protein, and damage it in a very controlled way, simply by pulling at it – a bit like torturing a protein if you will", he says. "Normally this stretches a protein apart, which we call unfolding. To our surprise we found that Hsp70 was able to protect the protein, and keep it almost fully intact. It was almost impossible to stretch and damage a folded protein when Hsp70 was bound." This was a surprising result because the textbook model of Hsp70 says that the chaperone likes to bind to extended peptide chains. These chains are exposed when a protein is first made or when it gets damaged. Thus, according to the existing model Hsp70 stabilizes the stretched and unfolded state of a protein, but not the folded state in which the peptide chains are folded up. "This chaperone is quite a complex system", Tans says. "Hsp70 changes its shape drastically when it burns the fuel-molecule ATP, just like a car engine that burns fuel. One part of the protein acts as a lid or lever that opens and closes. Normally this movement goes quite fast, so we stopped the cycle using a trick. We found that when we added large quantities of hydrolyzed ATP molecules, called ADP, Hsp70 bound and stabilized the protein for a long time. This makes sense, because we know from biology that when cells are stressed and its proteins need protection, ADP indeed accumulates. In other experiments, we also saw that proteins were resistant to higher temperatures and thus were more stable in the presence of HsP70." This research shows that existing models of how HsP70 works need to be adjusted. "We should look at the many functions of this chaperone in the cell from a different perspective. For instance, our results show that Hsp70 can truly drive folding itself, rather than just block aggregation between exposed protein chains. Moreover, the working mechanism we discovered might allow Hsp70 to directly bind folded receptors and hence regulate their activity", says Tans. "With a better understanding of what HsP70 does and which parts are involved, we can ultimately search more effectively for ways to repair failing protein processes in the many conditions in which it plays an important role." 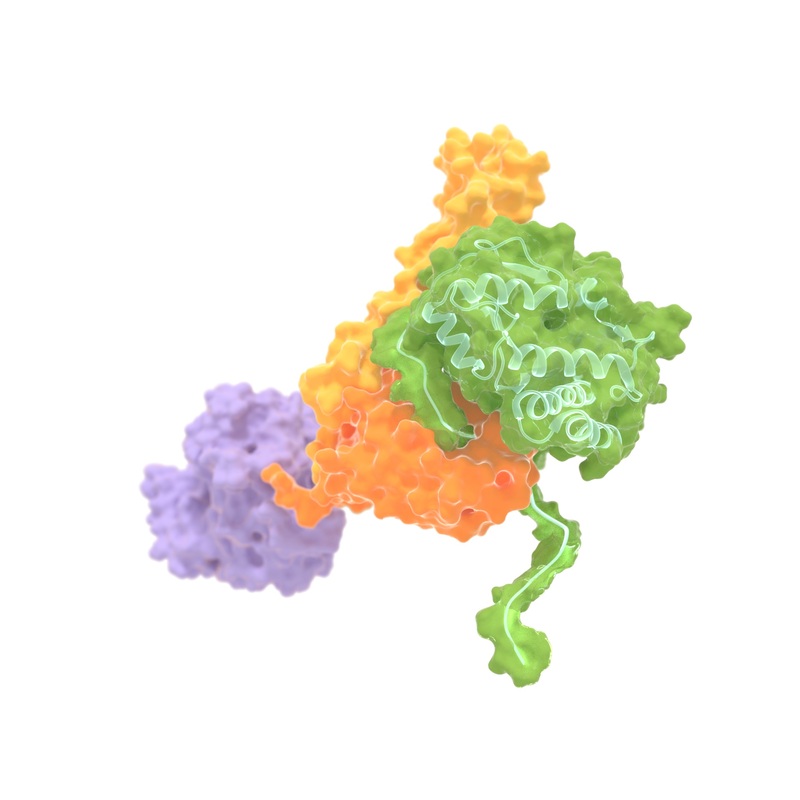 HsP70 Artist impression of Hsp70 that clamps a folded substrate protein (green) between two domains (orange and yellow). The third (purple) is the ATP binding domain of Hsp70. Tans and his colleagues discovered that Hsp70 not only binds unfolded chain segments, which destabilizes folded proteins. It can also do the opposite: to bind and stabilize folded protein states. This finding has implications for the many physiological roles of Hsp70 in cells. (Image credits: M. Avellaneda & S. Tans).